Last summer, the students in computer science professor Jim Boerkoel’s Human Experience & Agent Teamwork Lab (HEATLab) studied several aspects of human-robot interaction and wrote up their findings. This summer, they will celebrate the publication of three papers at the International Conference on Automated Planning and Scheduling (ICAPS) in Berkeley, California. 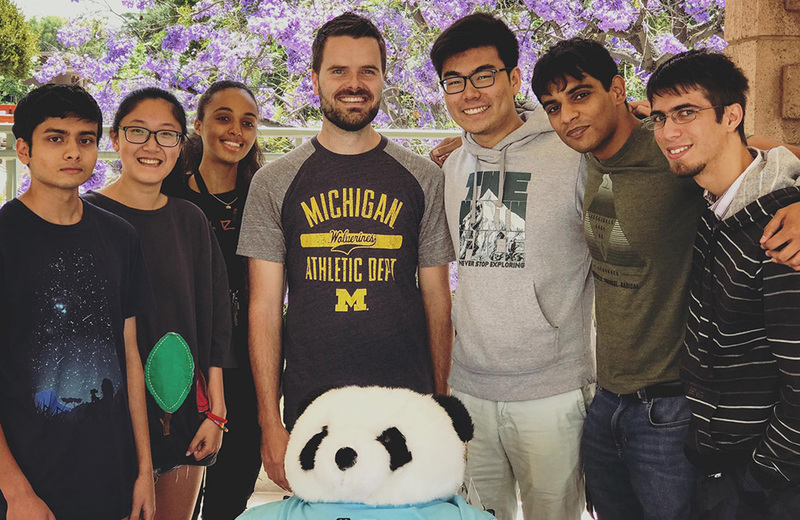 Shyan Akmal ’19, Savana Ammons ’20, Maggie Li ’19 (“Quantifying Degrees of Controllability in Temporal Networks with Uncertainty”), Joon Lee ’20, Viva Ojha ’19 (“Measuring and Optimizing Durability Against Scheduling Disturbances”) and Jordan Abrahams ’19 (“Reducing the Computational and Communication Overhead of Robust Agent Rescheduling”) were members of the summer 2018 HEATLab team. Shyan Akmal ’19, Savana Ammons ’20, Maggie Li ’19 launched a new student-led project that looks to deal with situations where scheduling uncertainty outstrips an agent’s ability to control for it. They developed new analytical tools for assessing what they coined “the degree of controllability,” which measures the likelihood that an agent (e.g., robot) can control for the presence of scheduling uncertainty (due to, e.g., slippage or localization error). In addition to these new analytical tools, they also developed and empirically validated approximate methods for finding scheduling strategies that maximize likelihood of success. Joon Lee ’20 and Viva Ojha ’19 use geometric interpretations of scheduling problems to develop new ways to quantify a schedule’s resilience to unexpected scheduling disturbances. In particular, they defined a new concept, “durability,” which characterizes a temporal plan’s resilience to disturbances. They also proposed several durability metrics and two new approaches for finding optimally durable schedules. An additional contribution was an empirical model for simulating realistic sources of schedule uncertainty, which they used to perform a systematic empirical evaluation of proposed metrics and approaches. Jordan Abrahams ’19 and co-author Jeremy Frank built on the work of the 2017–2018 NASA Ames Research’s HMC Computer Science Clinic team to explore how they could adapt uncertainty-aware, dynamic scheduling advice to be more judicious in how often rescheduling, and, by extension, communication, was required in multi-agent settings. In particular, they introduced a single streamlined algorithm that trades robustness for various forms of computational overhead including multi-agent communication. In addition to these algorithmic advances, they contribute a systematic, thorough empirical evaluation that significantly improves the understanding of this space of tradeoffs. Posted in: Computer Science, Research, Students.